Canberrans have long loved their sport. Going right back to Canberra’s early years, our region was home to a variety of active sporting clubs including tennis, rugby league, rugby union, Australian Rules, soccer and cricket. Our first public sporting ground, Manuka Oval, was opened in 1923 and the Canberra Golf Club established itself in Acton in 1926. This month we are exploring records relating to the proposed Lake Jerrabomberra Aquatic Centre as ArchivesACT’s August Find of the Month. The 1980s was a decade of excess. It was the time to go big – big hair, big shoulder pads and big ideas. And one of the biggest ideas in Canberra at the time was to bring an aquatic wonderland to Jerrabomberra Creek. The initial focus was to develop a world-class rowing facility. While Lake Burley Griffin provided some facilities for rowing, it did not cater well for senior level competition. Spurred on by rowing’s peak bodies, a preliminary study was undertaken"to determine how an international standard rowing course could be accommodated at a site on Jerrabomberra Creek". 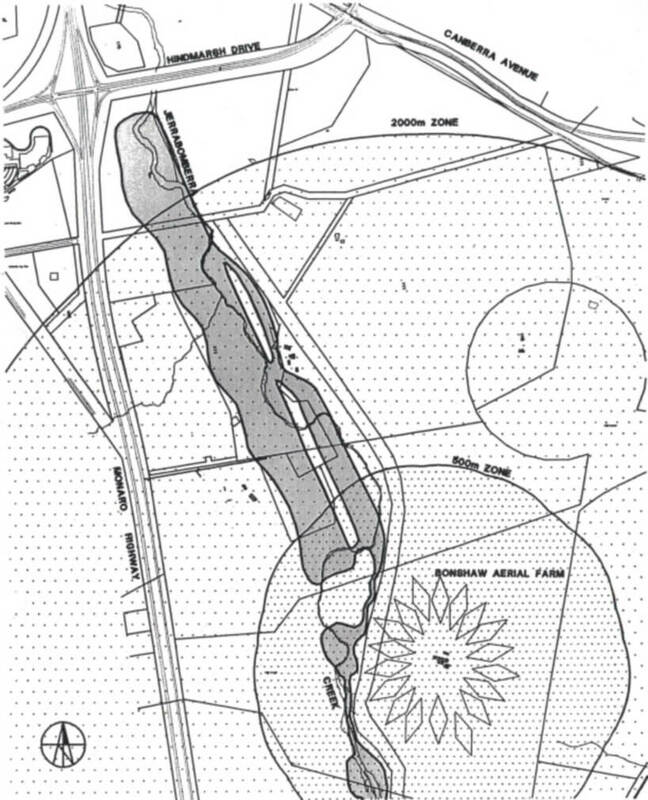 In October 1983, representatives of the ACT Rowing Association, the Australian Rowing Council, the World Rowing Federation (FISA), the National Capital Development Commission and the Department of Territories inspected the Jerrabomberra Creek site, bordered by Hindmarsh Drive and the Monaro Highway. FISA’s Australasian delegate pronounced that a rowing course on the site"has the potential to be the best in Australia; providing a top class facility for the AIS, Local, State and International regattas”. Option A – Basic recreational lake. This would be the most basic development with a 2km rowing course and facilities for water skiing, including a boat ramp for launching motor boats. There would be no development of the surrounding area. 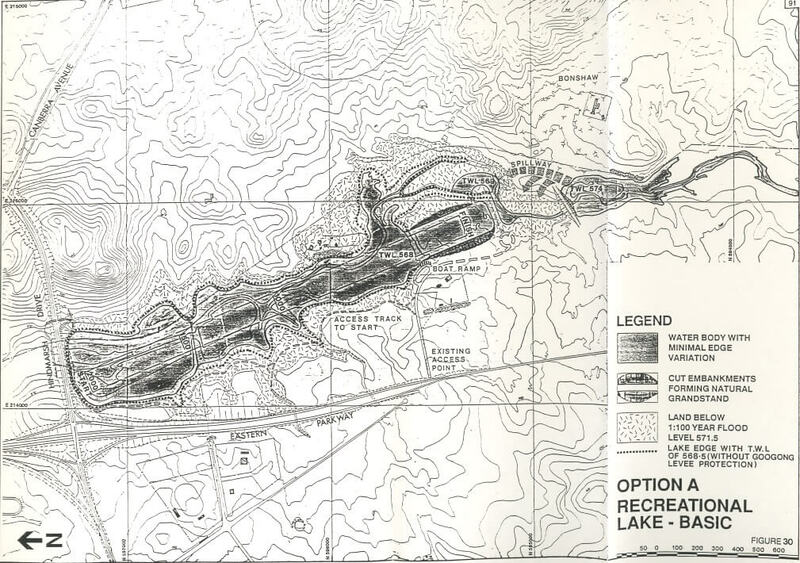 Option B – Developed recreational lake. 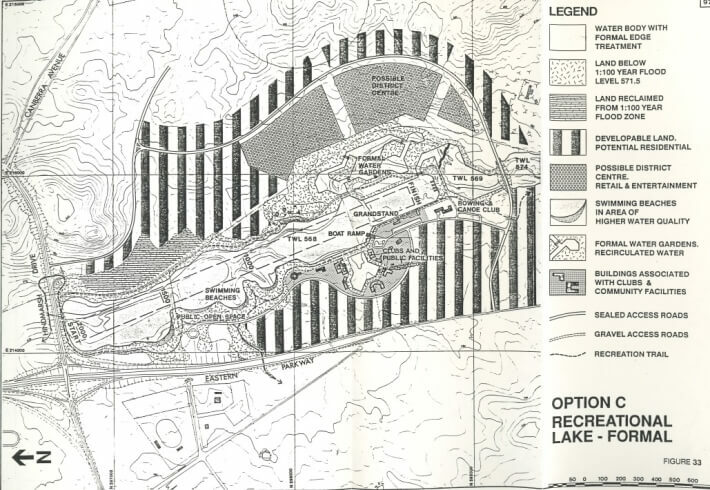 This option built upon Option A and explored the development of the surrounding area including an enclosed swimming area, 18 hole golf course, rowing and canoeing club, and additional public facilities such as a grand stand, car parking, amenities and a larger boat ramp. Option C – Formal recreational lake. This option built upon Option B and considered the potential for urban development in the Jerrabomberra Valley with the lake as a focal point. It explored the possibilities for a wide variety of additions to the area including formal gardens, club houses, community facilities, swimming beaches, a trout farm, aquatic theme park, hotel complex and a retail and entertainment precinct. As is the norm with most projects of this magnitude, there were some obstacles to overcome. The development site was home to major water supply and sewerage infrastructure, in the form of the Googong water supply mains and Jerrabomberra truck sewer. 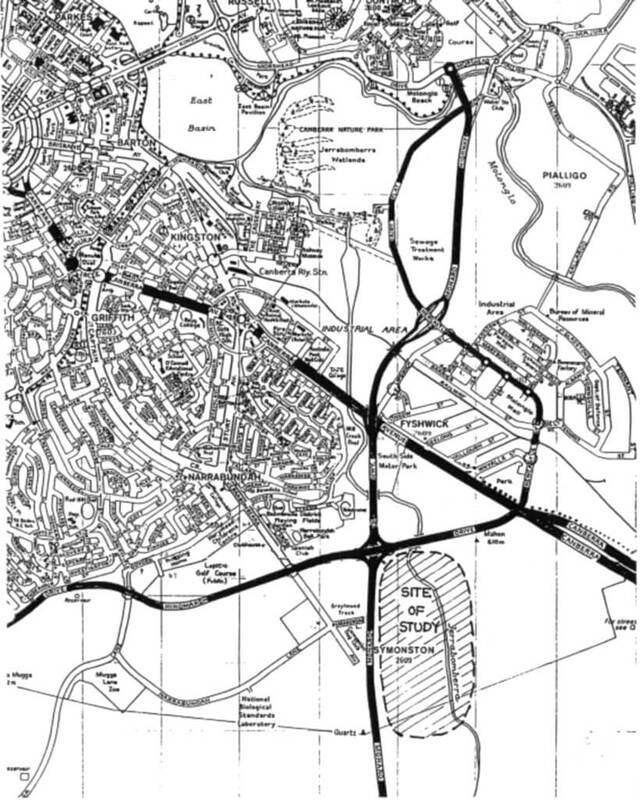 There was also a major electricity line planned by Actew for the area. Another major stumbling block for the development was the nearby Defence facility Naval Receiving Station (NRS) Bonshaw which was part of Naval Communications Station (NAVCOMMSTA) Canberra. Bonshaw was a High-Frequency (HF) Receiving Station and as such, there were limitations placed on the types of activities that could be conducted in the surrounding area so as to not produce potential interference e.g. construction noise and noise of watercraft. The station was scheduled to be relocated to Wagga Wagga, but likely not until at least the year 2000. These obstacles appeared too difficult to overcome at the time and the plans were shelved. Fast forward to 1996, and an enthusiastic ACT Rowing Association lobbied for the proposal to be revived. 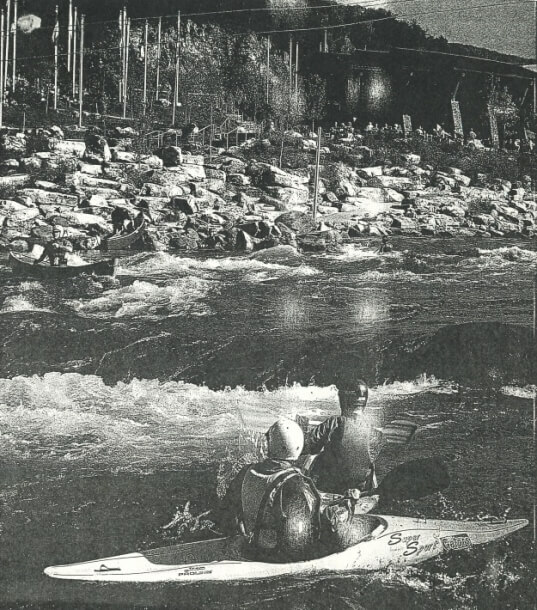 Their focus was to address the fact that there was still no high-quality rowing course in the region, but they were also keen for authorities to consider a venue to cater for canoeing, water skiing and jet skiing, the belief being that "the Jerrabomberra proposal offers exciting opportunities to broaden the base of the ACT’s sporting facilities and assist in attracting more events and training squads to the city”. A feasibility study was commissioned at a cost of approx. $100,000. By now, IOC President Juan-Antonio Samaranch had made his famous announcement "And the winner is…Syd-e-ney!” and Australia was gearing up to host the 2000 Summer Olympic Games. 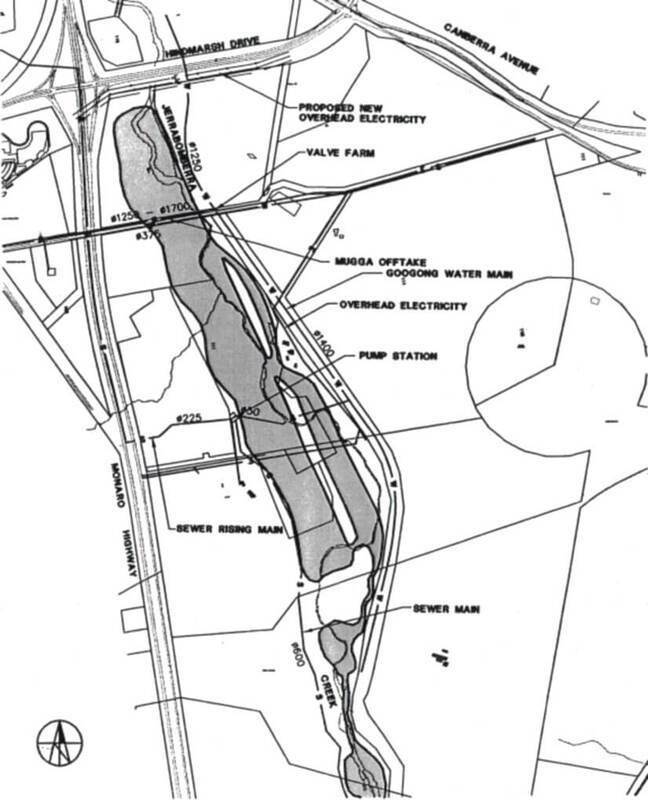 The Sydney International Regatta Centre was under construction on the banks of the Nepean River in Penrith, but such was the enthusiasm for the Jerrabomberra project that the belief was it had even greater potential than the Penrith venue with a "grand feeling engendered by the site”. The basic re-imagined plan was for two basins: a main basin incorporating a rowing and canoeing facility which could cater for international-level competition and a secondary basin providing a marshalling and warm-up area as well as a facility for competition water skiing. The concept began to grow and soon there was the suggestion to also incorporate whitewater kayaking, canoe polo, power boating, cycling and triathlons. Proponents could take inspiration from a recent development in the United States where a dried-up riverbed between Cleveland and Ducktown in Tennessee was transformed into the Ocoee Whitewater Center. This was the first example of a natural riverbed undergoing a major reconfiguration specifically to facilitate water sports. 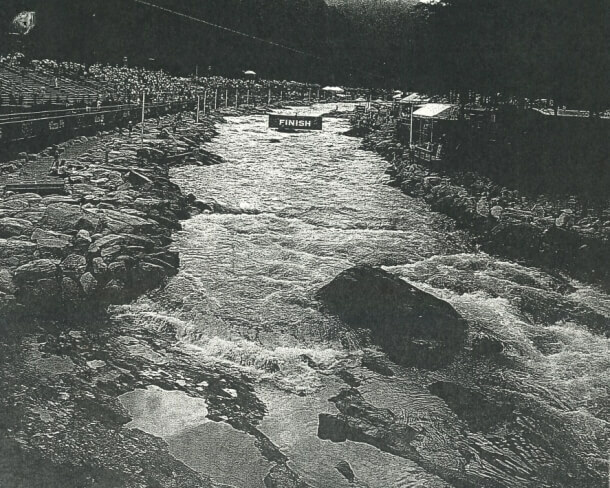 It also became the first natural river to host an Olympic whitewater event. The proponents felt the project had a huge range of benefits such as growing tourism, providing an international aquatic sporting facility, supporting the development of water sports, generating revenue, and enhancing land values for residential development nearby, all while being ecologically and economically sustainable. So why aren’t we now kayaking down Jerrabomberra creek or frolicking on Jerrabomberra Beach? 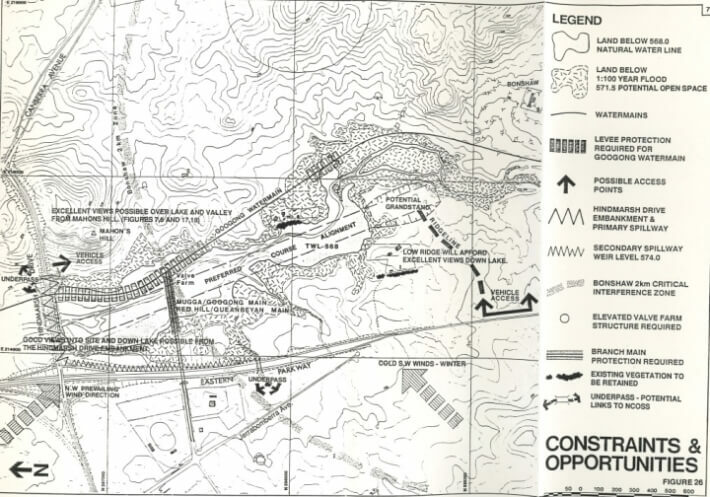 The precise reasons are unclear, but correspondence between the consulting engineers and Actew Corporation in late 1997 give us an indication as to why the grand plan for Jerrabomberra Creek never went ahead. As much as the average person loves sport, they tend to love a reliable electricity supply and sewerage services even more. The locations of watermains supplying Googong, Mugga, Red Hill and Queanbeyan were problematic, as they were very close to the proposed development, as was substantial power supply infrastructure. 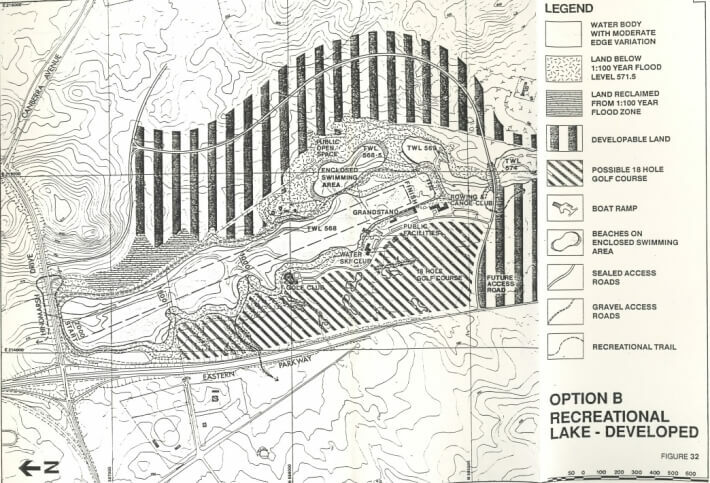 All this existing infrastructure would require protection, and by late 1997 it had become apparent that this need would severely limit "options for lake orientation and shaping", not to mention a price tag of approximately $600,000 for earthworks alone. Actew’s Principal Engineer of Sewerage Planning, Peter Szlapinski, stated that the proposed development "will have a substantial impact on existing sewerage infrastructure and has implications affecting the future strategies for wastewater management in the Valley”. Similarly, the estimated costs to relocate the electricity infrastructure were eye-watering. For example, the cost of relocating the aerial feeder was estimated at $20,000 per kilometre for removal of the redundant mains and $50,000 per kilometre for new aerial line construction. The Jerrabomberra Valley area was largely undeveloped at the time but had been zoned for future land releases. Canberra was rapidly growing, and estimated investment needed for a new sewer network in the area was in the vicinity of $60 million. Actew was keen to stress how important it was "that infrastructure projects constructed in the Valley ahead of the land release program, recognise and minimise possible constraints on these future services". There was also growing concern that the development would have a significant effect on flood levels and the lake footprint. And so it would seem that by the end of 1997, the odds were stacked against the proposed Lake Jerrabomberra Aquatic Park. If you are interested in further research on this topic, please contact ArchivesACT through our"Request a Record” service.